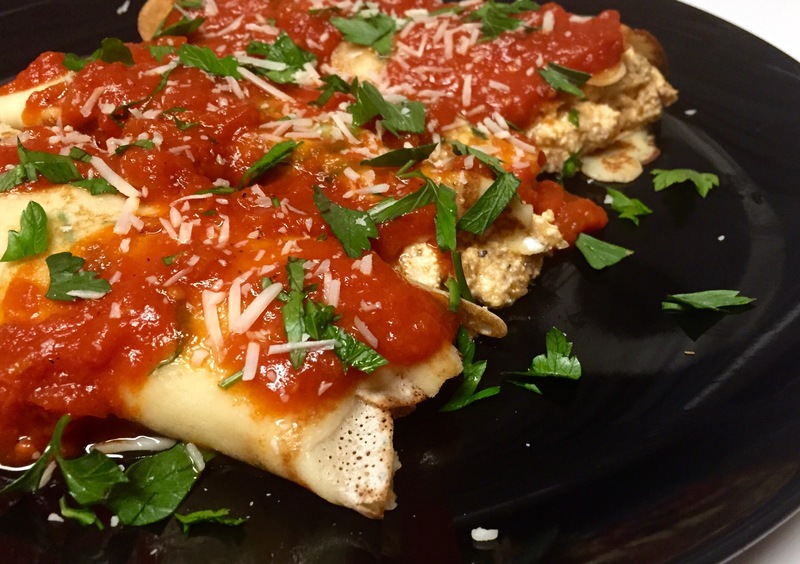 Round Two Recipe: Beef and Eggplant Stuffed Crepe Cannelloni – Pao Says, "Open Wide!" After spending almost 11 hours in clinic today, I felt great knowing that tonight’s dinner was already half-way made. Yesterday’s meat and eggplant stuffing marries with rich ricotta cheese to become the filling for my crepe cannellonis! I heated the leftover meat mixture from the stuffed eggplant yesterday and combined it with some ricotta cheese. I had about 1/3 lb left of meat left and I mixed it with about a cup of ricotta… It’s not an exact measurement but that’s what I used, just for reference! I combined all of the ingredients for the crepes and then cooked the thin crepes on a hot non-stick pan. Once the crepes were cooked, I stuffed them with the meat and cheese and topped them with some of yesterday’s marinara sauce and parmesan cheese (and parsley for garnish).